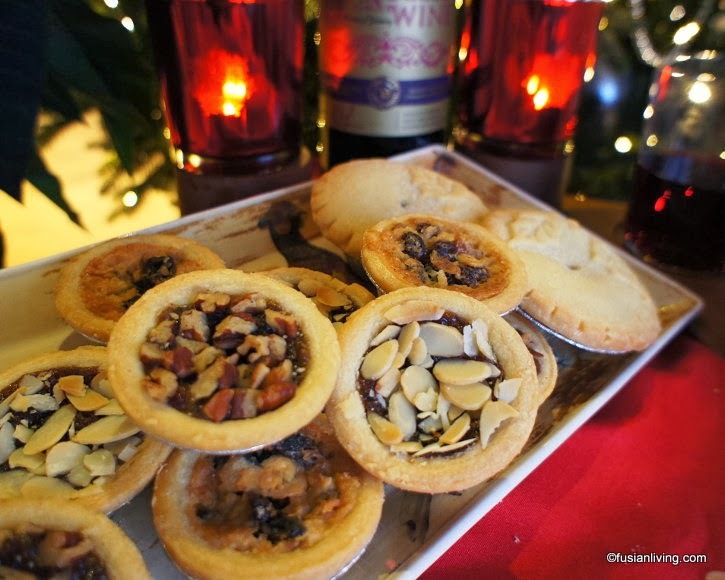 Kicking off Christmas with Taste the Difference Ecclefechan tarts and mulled wine | Grow Your Own Veg Blog. Gardening and Food Blog. Kicking off the festive season with fruity tarts and mulled wine! Christmas is just around the corner, and here at the Richardson household, the countdown has begun! Our new Christmas tree arrived just a few days ago and has now been put up; Christmas decorations have been brought out from storage and the home music system, much to my husband's dismay, is now permanently tuned to this Christmas channel. All that is left to do to get into the spirit of Christmas, is to bring out the mulled wine and mince pies! Thus, a special Christmas parcel delivered to my doorstep on Saturday morning from the friendly folk over at Sainsbury's made for a very timely arrival. 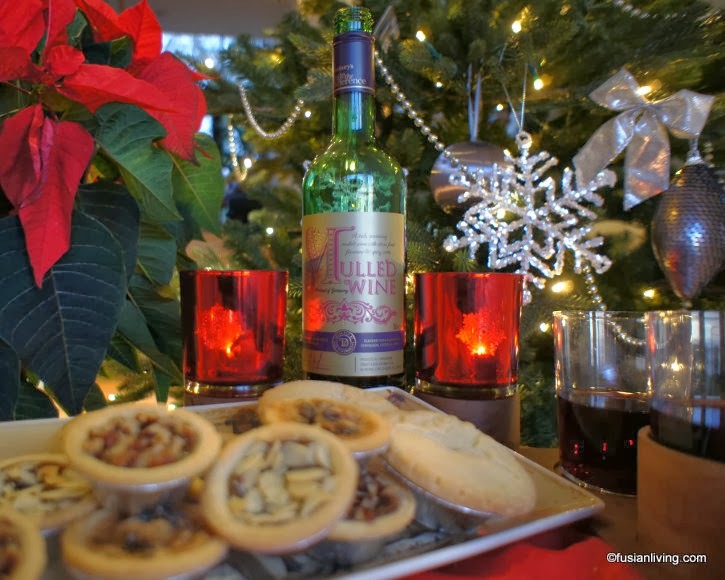 For inside, was a lovely Christmas hamper of Taste the Difference mini Ecclefechan and mince meat tarts, Taste the Difference mulled wine and a bottle of Irish cream. If you haven't heard of an Ecclefechan tart, they are a traditional tart originating from Scotland, and are named after the town Ecclefechan situated midway between Lockerbie and Annan in Dumfries and Galloway. Sainsbury's introduced them nationally as part of their Christmas campaign in 2007, and since then have proved very popular during the festive season. Ecclefechan tarts have also been described as being similar to a pecan pie. These ones had a scrumptious filling made from butter, eggs, sultanas, currants, almonds, cherries, demerara sugar and vinegar. Also in the same box, were tarts filled with a sweet zesty orange and cranberry mincemeat, and topped with flaked almonds, which added a lovely little crunch. 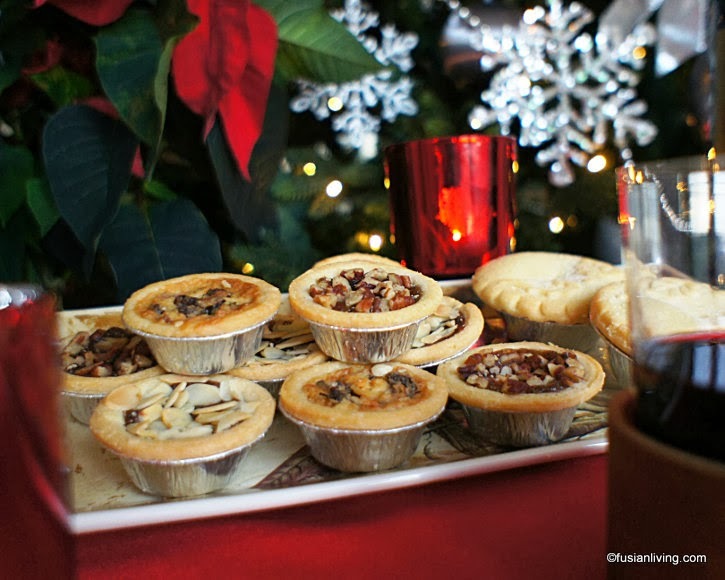 And then there were the pecan topped maple and pecan mincemeat tarts. These mini tarts are the perfect size for entertaining because let's face it, sometimes your guests might just want a little bite to eat and there is nothing worse than trying to conceal a half eaten mince pie in a bit of paper napkin. Our box, though, did not last long enough for us to taste test them with our guests - we ate most of them during this photo shoot, sampling the Taste the Difference Mulled Wine at the same time. This spiced wine was a lovely deep ruby colour and when gently heated, became wonderfully aromatic, sweet and delicious. Stocking up on a few ready made bottles of mulled wine is perfect for when unexpected guests turn up at your door. Simply heat and serve! We wish you a very Merry Christmas and hope you are enjoying your mince pies and mulled wine too! Thank you to Sainsbury's for sponsoring Taste the Difference mini Ecclefechan and mincemeat tarts and Taste the Difference mulled wine.